There are many different approaches to teaching children to write. Most have their advantages. But often they teach lowercase letters in conjunction with the uppercase letters. This approach assumes that because your child can recognize lowercase letters, they are ready to learn to write them. I disagree. I feel, and other OTs agree with me, teaching children to write with capital letters first is the better strategy. First, capital printed letters are the straightest, simplest forms of most letters in the English alphabet. They almost all start and stop in an easy to understand place on the page. You stop O when you get back to the top. You stop the lines for X and K at the top and bottom lines of the paper. They are both easier to teach and easier to learn to form than their lowercase versions. How do you explain to a child exactly where to start or stop the small marks in r and k? That little curve of r has no clear stopping point. You just have to have enough sense of how the letter should look to make it correctly. Secondly, capital letters, in their simplest form, don’t have to cross back over their own line. Little m or n, require the child to make a line down, then make a line up over that line to then make the small bump next to it. Many small children can’t fathom why you would need to make a line over another line. They often can’t make a straight line once, much less twice in the same space. How do you explain how to draw that bump as the next step? It has to be not too tall, not too short, and not too fat. Straight lines and circles are the easiest shapes to make. Curves and intersections are the hardest and there are fewer of those in the uppercase alphabet. Should your child learn to write in capital letters first? This is a different question entirely and the answer is actually “it depends”. 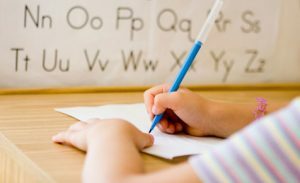 Is your child truly ready to learn to write? Do they already know all of their letters, upper- and lowercase on sight? Can they hold a pencil in a tripod grasp and use it to draw a person with at least 8 body parts? Can they sit at a desk and draw shapes like squares and triangles well? If you answered yes to these questions, your child may be ready to learn to write in both upper- and lowercase letters. You can even start with cursive if you want. However, if your child is able to do all of this they are probably 6 years old or older and have no learning challenges that affect their ability to write. 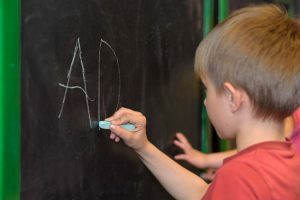 If your child has learning disabilities, developmental delays or problems with visual perception or fine motor control, learning to write is to be harder for them than typical children. Your child will most likely benefit from slowing down and learning to write in capital letters first. 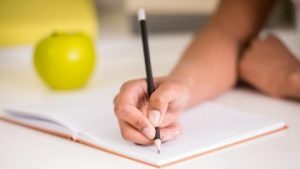 Your child may do best with spending a year or more writing only in uppercase letters, while their brains and bodies continue to make connections in their own time. By learning to write in uppercase letters your child can write their name, and work on learning to spell simple words. When your child’s fine motor and visual perceptual control improve, you should find a handwriting curriculum that you can use to teach writing lowercase letters correctly. Just because your child learns to do it later, doesn’t mean they won’t need instruction on how to write the letters correctly. When your child is ready, you can choose whether to teach print lowercase letters or cursive, too. Our schools today are pushing most children to write before they are developmentally ready. For this reason, OT’s advocate teaching capital letters first as a way to slow down. 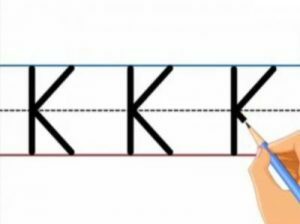 Working on the easier capital letters is a way to let kids who aren’t ready to write catch up and learn how to control a pencil before making the harder lowercase letters. This leads to fewer kids in OT down the road. Too many kids are being pushed into writing before they are ready, developing bad habits, and drawing letters instead of writing them. All of this leads to illegible handwriting. I believe in the value of learning uppercase letter first. So our new program, Foundations & Fundamentals, focuses on teaching uppercase letter writing. It also has pre-writing pages and works with children on drawing shapes. 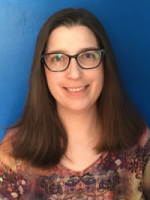 My passion as a curriculum writer is to help children who need a multisensory approach and to help children build underlying developmental abilities. This new program is designed to teach uppercase letter writing, basic phonics, colors, and shapes while providing a list of interesting books to read and projects to do to keep learning fun! Curious about Foundations & Fundamentals? If your child is curious about letter sounds and is showing signs of being ready to write, take a look at our new program, Foundations & Fundamentals. It is a great way of introducing phonics, handwriting, and math through picture books and hands-on learning. Previous: Previous post: Foundations & Fundamentals, Our Newest Program, is Now Available!